Eeekems! 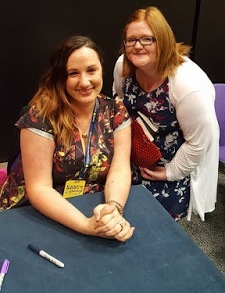 I've not really blogged since June/July which means I'm wayyyy behind with everything in my inbox, reviewing books, organising and scheduling posts! Literally everything but nopes I've not just took a break (I wish) My computer *touch wood touch wood touch wood* it doesn't again! (I felt lost without it!) busticated itself about a million trillion times and everytime I took it to PC world to get fixed well they were as helpful as a bunch of monkeys playing Nintendo! (Not the DS the actual one from years ago.. omg member that? I <3 it! That means they weren't helpful and literally buggered me right of! Anywho.. I have my computer back... and I am trying to fix and get through everything! I am currently literally going through it day to day to hopefully get some organistion back into my blog! I feel like a revamp but that's not important so :( it has to wait! Boo! I did have all these awesome plans for Reading A Little Bit of Everything although I'm gradually bringing my self into it and not full force as I know if the pressure hits again I'll just wanna break the computer myself! I hope you had a very Merry Christmas and an awesome start to the New Year! How did you celebrate?